Hi! My name is P.T. Custard and this is my story. It all began on a wintery, slushy afternoon in Royal Oak, Michigan. The Lions were playing at home, the doctor had season tickets and NEVER missed a home game, my expectant mother begged him to stay near the hospital because she had a certain feeling, and sure enough in the third quarter I was born. I grew up in Baltimore, Maryland heavily influenced by the writings of Edgar Allan Poe, the pitching arm of Jim Palmer, and the bounty of the Chesapeake Bay. After graduating from Colorado State University (inspired to go to Colorado after listening to John Denver, it was the 70s) with degrees in both Natural Resource Management and Range Conservation, I embarked on a career with the National Park Service as an educational specialist and promptly forgot all I had learned in college. After working my way through National Parks nationwide I switched gears a bit and began working in museums. It was within the museum field that I began to write educational curriculum materials and activity books for children, to great success. This led to friends and colleagues, and occasionally colleagues who were also friends, asking repeatedly of me, "When are you going to write a children's book?" When I found myself by chance living at lighthouse with my dog Jules, I decided this was the time to answer their questions with "Now!" and write a book. The rest, as is said, is history. 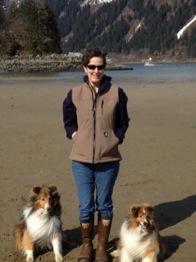 I live in Alaska with my husband, Buddy, and my two dogs, Truman and Thomas. When I am not writing or sharing my books through classroom visits, book signings and book fairs, I volunteer as a DJ at KRNN radio, volunteer with the Imagination Library, enjoy exploring the trails near my home, and read, read, read. I am available for classroom visits in person or via Skype and can tailor my presentation to best fit the needs of the teacher; from a simple book reading for the very young student to a discussion on how to write for the older student. I am also available for presentations at libraries or with adult groups interested in learning how to take a book from concept to publication. If you would like to have me speak to your class or group, please contact me using the contact link at the bottom of this page. May you always know the joy of reading!